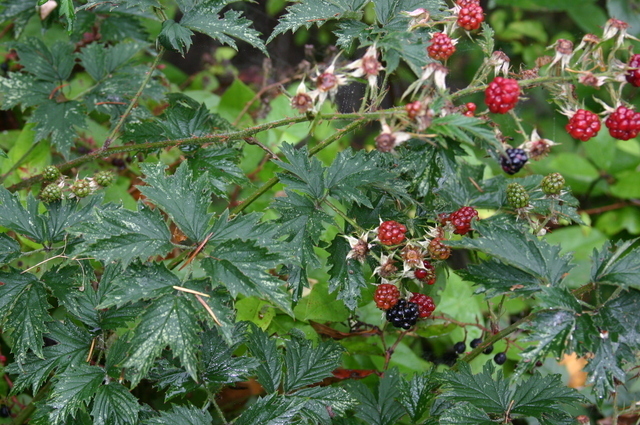 Rubus laciniatus.Les mehrhoff.www.discoverlife.org (Accessed 8/2014). Rubus laciniatus is an arching, prickly shrub. Stems coarse, often reddish, ribbed like R. allegheniensis, to several m long, scrambling, often vine-like habit, usually not erect, strongly armed with curved, flattened, long-based thorns. Leaves alternate, evergreen, appearing more “ornate” than R. allegheniensis, palmately compound, leaflets hairy, green below, usually 5, lobed or divided, margin toothed, largest ca 5 cm, stalk strongly armed. Flowers pinkish or white, in clusters, petals 3-lobed. Fruit elongate, to 1.5 cm wide. Fruit fleshy, black, multiple, 1-seeded black drupes (unripe fruit red) adhering to receptacle. Habitat: Mostly around old house sites but also escaped in disturbed areas. Appears somewhat shade tolerant.